On Tuesday, July 1, 2014, multiple agencies responded to reports of a brush fire in the Brooker Creek Preserve near the Hawks Landing subdivision. In the early afternoon, the second of multiple brush fires flared up and kept firefighters busy for many hours. 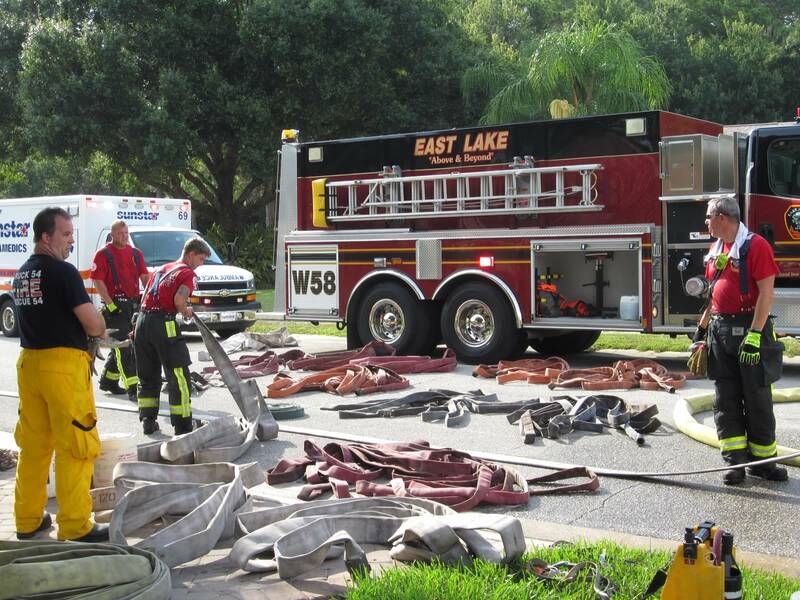 The heat index on the fireground was estimated at about 102 degrees. This extreme temperature along with the prolonged time was just one factors that required crews to enter firefighter rehabilitation. Firefighter rehabilitation has been defined as an intervention designed to mitigate against the physical, physiological, and emotional stress of fire fighting in order to sustain a member’s energy, improve performance, and decrease the likelihood of on-scene injury or death. In addition to crews battling the brush fire another local resource was mobilized. This resource was the East Lake Community Emergency Response Team (CERT). 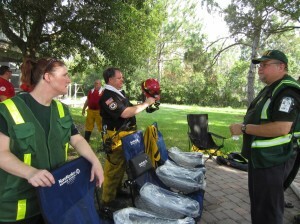 East Lake CERT was activated shortly before 4 PM to assist in providing with firefighter rehabilitation. CERT members met at East Lake Fire Rescue Station 57 to load up the needed supplies. Team members assisted in the setup and layout of the rehabilitation center. Firefighters were checked in and out of the center by CERT along with the setup of cooling chairs along with distribution of coolers, ice, cold towels, snacks and water. Training is invaluable to having a successful CERT. In addition to the required basic training, many other training modules have been developed such as animal response, emergency communications, leadership, traffic/crowd management, search and rescue, firefighter rehabilitation, and flood response. East Lake CERT had just completed a training session on firefighter rehabilitation the evening of June 23rd just about a week prior to this real activation. Additional information can be found HERE regarding CERT and the location of local programs. 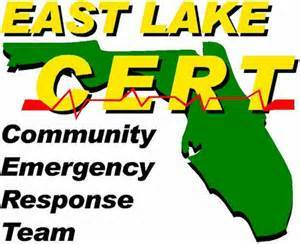 Both East Lake and Lealman CERT frequently hold free basic training sessions.